HostMetro Review 2019: Is HostMetro a Good Hosting? HostMetro provides their primarily U.S.-based customers with affordable, feature-rich web hosting services. The company seeks to be a reliable and easy-to-use hosting provider for businesses of all sizes. HostMetro is a U.S.-based web hosting vendor with affordable hosting solutions backed by expert technical support and an extremely thorough knowledge base. They were founded in 2012 and specialize solely in shared hosting. The company is one of the few providers that offer a price lock guarantee, ensuring that their customers won’t get a shock upon renewal. With their two shared hosting plans, their mission is to be a reliable hosting provider for individuals and small to mid-sized businesses. In addition to the United States, they have a considerable presence in Bulgaria, the United Kingdom, India, and Taiwan. HostMetro doesn’t have many hosting plans for users to choose from. This isn’t always a bad thing; in fact, because HostMetro specializes in shared hosting, it makes it relatively easy for potential customers to choose an appropriate hosting plan. The main variation between their two plans are the provision of a GeoTrust SSL certificate and the SiteLock Security Seal. This essentially means that if you’re running a business or an e-commerce website, go for their Super Max Plan; otherwise, the Mega Max Plan will do just fine. One aspect I didn’t quite like about HostMetro, however: their uptime can be rather spotty. They’ve only got a 99% uptime guarantee, which is lower than the industry-standard 99.9%. They’re also not great about providing details on the type of hardware and software they use, so you don’t know what kind of infrastructure your website is being housed in. Plus, backup-wise, you’re largely on your own: while HostMetro does take weekly backups of your data, this generally isn’t adequate for most users (particularly if you’re using a WordPress installation). HostMetro offers a convenient and free website migration service for users moving over from another hosting provider. The prices listed on HostMetro’s website shows the company’s commitment to providing affordable hosting plans. The biennial and annual payments will cost you less than paying on a monthly basis. 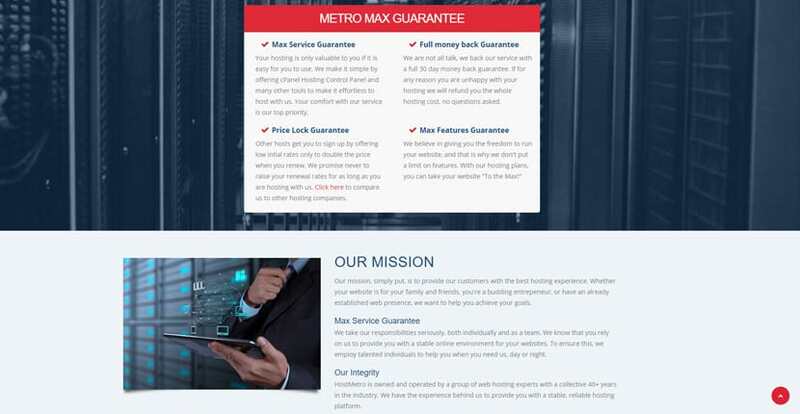 Plus, unlike many other vendors, HostMetro does not double their hosting prices after the introductory period: their price lock guarantee assures you that the low initial rates you’re paying are the same prices you will pay even after the promotional period is over. HostMetro has a 30-day money back guarantee, though this isn’t automatic: you’ll have to write in to request it. Further, if your account is suspended at any point during the 30-day period after account creation, the policy is voided, even if you’re unsuspended afterwards. HostMetro claims to offer 24/7 U.S.-based support. You can contact their customer support by opening a ticket, through the vendor’s live chat, or by phone. The company also has a comprehensive knowledge base that includes over 100 video tutorials. That said, while the company claims to have a support team with a combined experience of over 50 years, the ever-growing list of customers dissatisfied with their support implies that HostMetro might be somewhat problematic in that area. However, my experience with them wasn’t bad at all. The tech support team responded fairly quickly when I submitted a ticket, and the information they sent me adequately addressed the queries I had. HostMetro offers just two shared hosting plans, but each of them is packed with a long list of features that makes it easy to manage a website. However, customers should beware of their tech support, which can be inconsistent. Wondering how HostMetro stacks up against other Web Hosting companies? Enter any other Web Hosting company and we will give you a side-by-side comparison.